Earlier in the winter when we were being buried by storm after storm of snow, I dug out an ancient pair of snowshoes and put them to work. The old bear-paw style snowshoes made of wood with leather webbing and an old, brittle leather binding has been in my family for over 50 years. I remember my father using them when I was very young. Somehow I now have the old snowshoes and actually use them on occasion. This time I put them on to break a trail through the backyard to take the garbage to the shed. Without the snowshoes I was sinking through drifts in some places almost up to my waist. The old snowshoes did their job once again. 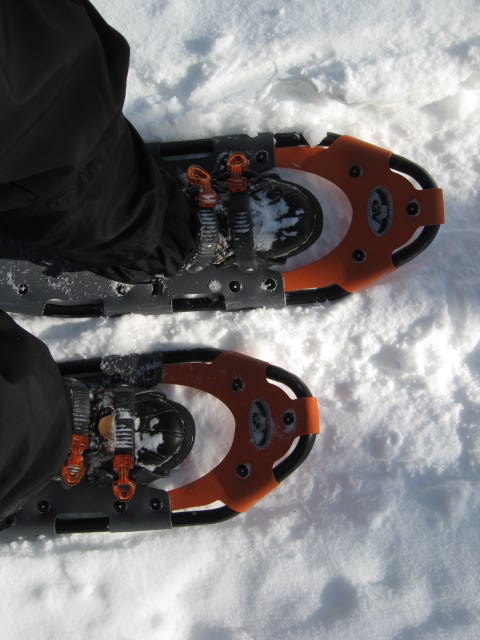 Snowshoeing has become a popular winter recreational activity in the last few years, thanks in part to the introduction of a new breed of lightweight, easy to use snowshoe. I was never much interested in snowshoeing as an outdoor activity because I’m a skier. If there’s enough snow to play in the woods I’m going to do it on skis. I always figured snowshoeing was too slow and too boring for someone who’s used to gliding through snow. But I recently learned that snowshoeing can sometimes be the best way to travel on snow under some conditions as well as being a lot of fun. I spent a winter weekend at Adair’s Wilderness Lodge past Sussex in what’s now known as Shepody. A group of us stayed in one of the comfortable cabins available for rent. On the Saturday a large group went snowshoeing along a fabulous trail that starts right from the cabin and follows along a ridge over to Walton Lake. I was the only person to ski the trail. That proved to be a mistake. The snow had a thick crust after a day of rain, making conditions difficult to start with. This is a hiking trail with plenty of ups and steep, narrow descents trough the trees. 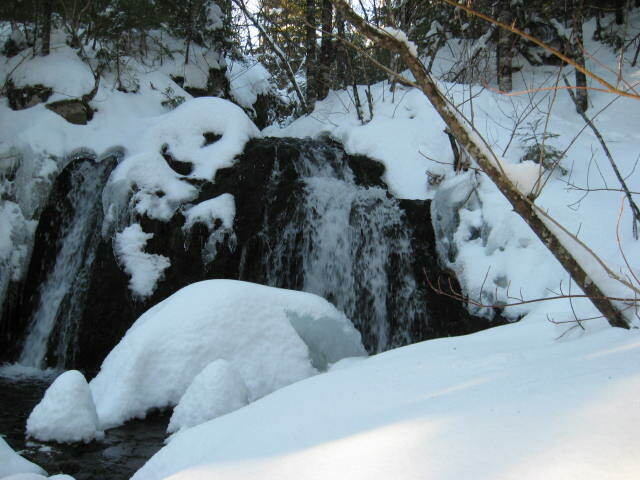 It crosses over streams on snow-covered logs and past two fabulous waterfalls. I struggled on skis and had to take them off and walk up and down some of the hills while my companions on snowshoes just motored along without a problem. It wasn’t until we reached the frozen lake that I could use my skis properly. Had I thought to bring my wider backcountry skis along with climbing skins I would have made out much better. But I have to admit that under those snow conditions and on that kind of terrain, snowshoes were the best form of winter transportation. The next day we did the trail again the opposite way. This time I strapped on a pair of snowshoes. It was the first time I’ve really tried out a pair of these lightweight and narrow snowshoes. They came with a ratchet style binding that was easy to use and held my boot in place snugly and comfortably. As an added bonus, most of these new style snowshoes come with steel teeth under the binding, something like crampons used in mountain climbing. The steady grip they provide was helpful in the crusty snow conditions we encountered that day. They made the climbing up and the going down much easier. And their relatively small size and narrow shape made walking in these snowshoes very easy, even for someone unaccustomed to them like me. My ski poles added just the right amount of support and pushing power to make the day on the trail an enjoyable experience. I did discover however that my longer poles may be great for skiing but you’re better off with a shorter pole for snowshoeing. And even with all the skiing I do, my legs were sore the next day. 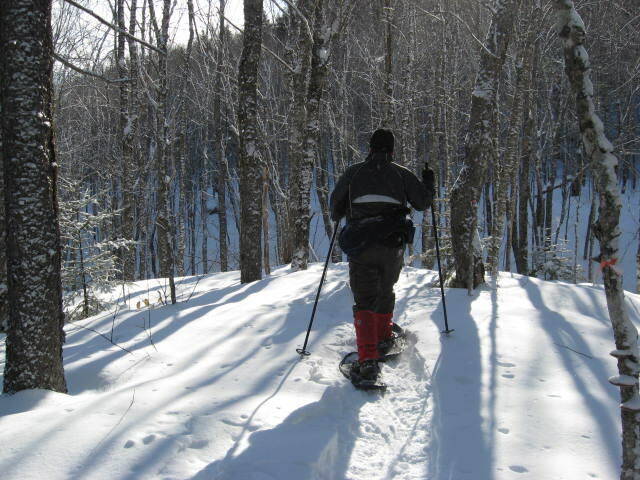 So in addition to being enjoyable, snowshoeing also gives you a good workout. We weren’t alone either. On the trail that weekend we met a number of people on snowshoes. There was even a fellow out on a pair of wooden snowshoes like the ones I have at home. He knew how to use them and had no trouble. I hate to admit it, being the ski snob that I am, but snowshoeing is OK and something I’d like to do more of. The new equipment can be pricey but if you’re going to use them, you might as well get something good. Some of our group actually rented snowshoes for the weekend from the Scout Shop. That’s probably a good idea, especially if you’re trying it for the first time. And if you’re looking for a good place to go for a day or a weekend, it doesn’t get much better than the trails you’ll find around Adair’s Wilderness Lodge. Doing Stuff Outdoors · For active people living life to the fullest.